I guess you also have a incorrect scale. DXF did not store any physical size. So the DXF import units inside the LayoutEditor had to set to the same value than the units you have used with autocad. 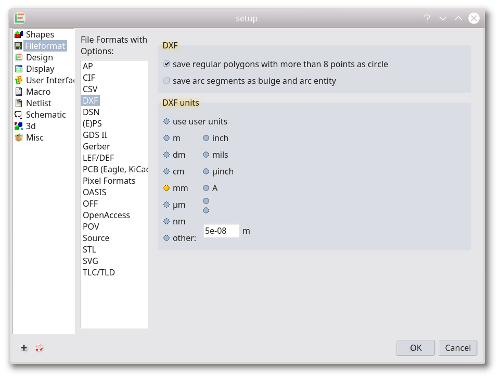 The DXF units are set in the setup dialog under *fileformat/DXF*: ! [DXF-setup.png](/api/img.php?thread=20180617-6aa8&file=DXF-setup.png) With to small DXF units in the LayoutEditor the design may be in the size of the default resolution of the LayoutEditor and accuracy is getting lost (of course you can alternative increase the default resolution of the LayoutEditor if the size is correct). If the DXF units are to big, you may get overflow errors. Once the DXF units are correct, you can adjust the resolution of bulges and arc with the LayoutEditor setting of angle resolution and bezier iteration. DXF often only stores the outline of the shapes. To get close shapes you will need to post process the design. 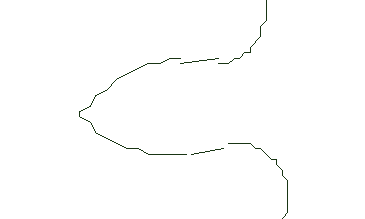 Use the *snap shapes* feature to remove small spaced between the lines, The *merge* feature will merge line segments to a single line, And the *Closed Path to Polygon* feature will convert the line to a filled polygon. If you have shapes with holes you may also need the *A xor* Boolean Operation from the *Bool on Layer* feature to get correct polygons with holes.